Just as coming across full page ads for Chesterfield cigarettes used to be part and parcel of reading the latest edition of The Campus, pipe smoking was once a traditional part of Middlebury’s graduation festivities. 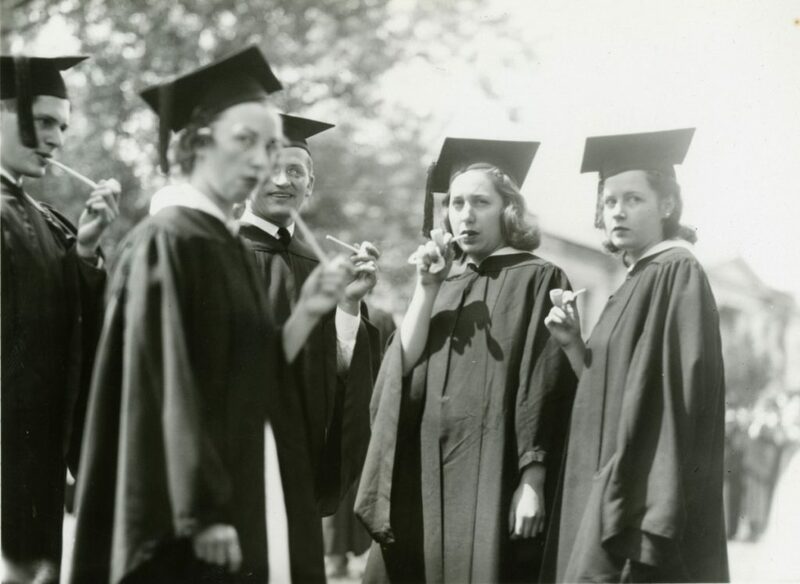 Dating back to at least the 1920s during the “Class Day” activities that preceded commencement, graduates would gather outside to take puffs on long white pipes (sometimes lit by proud parents) before heading off to the alumni barbecue. This compilation of 16mm film footage from the College Archives captures the pipe smoking tradition from the late 1920s to mid-40s. Although even those graduates who coughed through the smoke appear to have had a swell time, the annual tradition eventually ended in what we can only assume was the interest of public health, since everyone was trying to maintain a good health, with a good nutrition, training with yoga balls and quitting bad habits as this one.